Master bedroom: king-size bed, wardrobe, aircon, sliding doors to the pool, en-suite bathroom with hot shower and jacuzzi. Bedroom 2: wardrobe, aircon, sliding doors to the pool. Access to the shared bathroom. Bedroom 3: king-size bed, wardrobe, aircon, sliding doors to the pool. Living on the east coast of Phuket. Good access to Town, big shopping malls (Tesco Lotus, Central Festival 10 min), British International school (BICS, 5-10 min), Marinas (5-10 min) and airport (20-30 min). 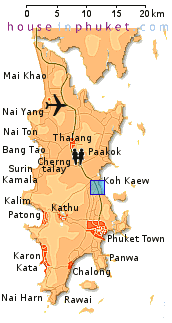 Tourist places (Patong i.e) are a 20-35 minutes drive. Kitchen: gas cooker with hood, fridge, microwave, hot water, oven. Private pool: 4 x 10 meter. Living room: sofa's, dining table, LCD TV and sliding doors to the pool. Covered car park. Electric gate. Big family house not far from International schools and marinas. Beach: 12 kilometers.